As one of our brand values states OnLogistics always aim to go that extra mile for our customers. We are ecstatic to report that one of our hardworking and diligent staff, Roger Moore (not to be confused with 007), has received a Gear Award. Our client, UTC Aerospace Systems, bestows these on individuals that give excellence and go above the line of duty. 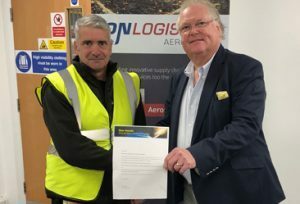 “Once again, thank you for demonstrating your commitment to the company’s operating principles; People, Ideas, Integrity and Performance.” Liam Franks, Operation Manager, UTC Aerospace Systems “We are extremely proud of our staff’s passion and commitment to always do an outstanding job.” Nick Bennett, Managing Director, OnLogistics If you are interested in joining the team at OnLogistics please see our careers page. Picture shows our Non-Executive Chairman, Lord Digby Jones, presenting Roger Moore with his Gear Award from UTC Aerospace Systems.